That is Dig and Delve. It is this Friday and Saturday. if you're interested please: text DIG to 613 777-1869. Hey everybody, I just wanted to talk with you a little bit about next week's Dig and Delve Apologetics Conference. Dig and Delve is an Apologetics Conference. 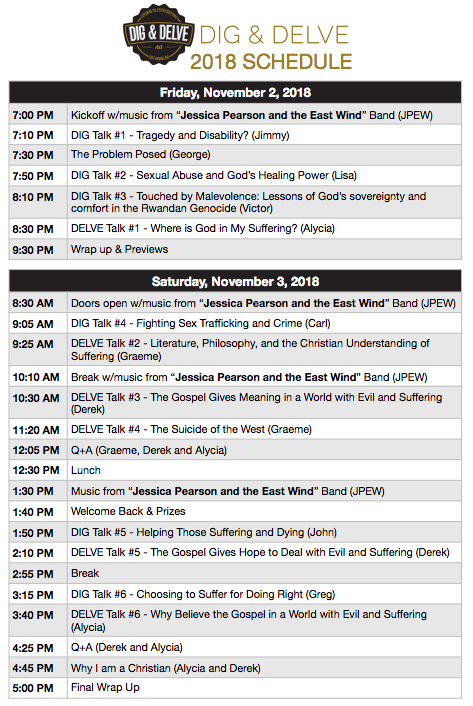 Dig and Delve is an apologetics conference we do every fall in Ottawa. Full disclosure: I'm on the committee. Actually, what's good about that is that means our church get's some discounted tickets - $20, for the whole weekend, Friday night and Saturday until about 5. So its a two-day conference for $20. We're actually really excited about this years conference. I am super excited about the theme, which is, "Life Hurts. God?" and the subtitle is, "Questioning the Goodness of God in a World of Pain". So we're going to be talking about different sorts of pain and suffering. We have some people doing an apologetic and theological approach. Alicia Wood, from Ravi Zacharias' ministry, will be speaking Friday night, so she's a trained apologist. Derek Rishmawy is a theologian, from Trinity Evangelical Seminary, which is the Evangelical Free Church seminary in the States, so he's one of our people, which is cool. And then Graeme Hunter is a philosophy professor at the University of Ottawa. So he's a local guy, and he's going to be speaking out of a philosophical approach. Now, Graeme is Catholic, so he's going to be taking a bit of a broader approach to the question, but the other two speakers are evangelical, and, in fact, by the end of the conference Derek is going to have the last two sessions on "The Gospel and Suffering" and in the last session he is also going to be presenting the gospel and we're going to have an invitation for people if its the first time they've heard the gospel to come and speak to people about how they can follow Jesus. I'm really excited about the short talks though. We have seven local people from churches here in town and they are going to be telling about their own personal experiences in suffering. They are going to be talking about things like, a doctor who counselled them to have an abortion because their kid had health issues and they chose to have the baby and raise him even in the midst of the hurt and hardship; another pastor who talks about a car accident his family went through and how his child was paralyzed; a guy coming who grew up in the Rwandan genocide; a woman who was sexually abused until she was fifteen; we have an officer who deals with human trafficking and those issues. So, those local speakers and those short talks, I am really exited about. It's Friday night and Saturday during the day. I know that on Friday night there are some campus ministry events going on, so even if you can just come for Saturday, I think it would still be good. I'm going to try to get our youth to go Friday night, and what I might be able to do is match a youth with a university student to share a ticket, so the youth could go Friday night and the student on Saturday. If you're interested at all in going, even one of the two days, let me know and I can get you in and get a discounted ticket to you.